You might be surprised to find out the real ages of these famous SURvers. How Old is Ariana Madix? HINT: Ariana is the same age as Kaley Cuoco and Keira Knightley. Ariana is 33 years old. How Old is Brittany Cartwright? HINT: Brittany is the same age as Taylor Swift and Daniel Radcliffe. Brittany is 29 years old. How Old is Billie Lee? HINT: Billie is the same age as Katy Perry and Mandy Moore. Billie is 34 years old. How Old is James Kennedy? HINT: James is the same age as Miley Cyrus and Selena Gomez. James is 26 years old. How Old is Raquel Leviss? HINT: Raquel is the same age as Harry Styles and Justin Bieber. Raquel is 24 years old. How Old is Jax Taylor? HINT: Jax is the same age as Adam Levine and Chris Pratt. Jax is 39 years old. How Old is Katie Maloney? HINT: Katie is the same age as stars Blake Lively and Zac Efron. Katie is 31 years old. How Old is Kristen Doute? HINT: Kristen is the same age as Mila Kunis and Chris Hemsworth. Kristen is 35 years old. 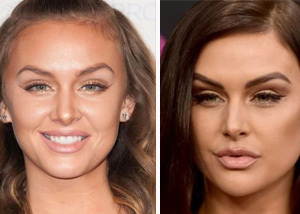 How Old is Lala Kent? HINT: Lala is the same age as Jennifer Lawrence and Emma Watson. Lala is 28 years old. How Old is Lisa Vanderpump? HINT: Lisa was born in the same year Bono and Julianne Moore. Lisa is 58 years old. How Old is Ken Todd? HINT: Ken was born in the same year Tom Selleck and Goldie Hawn. Ken is 73 years old. How Old is Michael Shay? HINT: Michael is the same age as Kesha and Wiz Khalifa. Shay is 31 years old. How Old is Peter Madrigal? HINT: Peter is the same age as Avril Lavigne and Khloe Kardashian. Peter is 34 years old. How Old is Scheana Marie? HINT: Scheana is the same age as Bruno Mars and Anna Kendrick. Scheana is 33 years old. How Old is Rob Valetta? HINT: Rob is the same age as Beyonce and Chris Evans. Rob is 37 years old. HINT: Stassi is the same age as Rihanna and Adele. Stassi is 30 years old. How Old is Tom Sandoval? HINT: Tom is the same age as Carrie Underwood and Jonah Hill. Tom is 35 years old. How Old is Tom Schwartz? HINT: Tom is the same age as Nicki Minaj and Eddie Redmayne. Tom is 36 years old. How Old is Jeremy Madix? Jeremy is 26 years old. How Old is Brian Carter? HINT: Carter is the same age as Avril Lavigne and Calvin Harris. Carter is 34 years old.